The Arkansas State Police has released a missing and endangered child advisory for missing 12-year-old Blaykin Armer. UPDATE - Arkansas State Police said Blaykin was found safe. Armer is missing from the Lead Hill, Marion County area. She is 5 feet tall and weighs 90 pounds. She was last seen wearing a yellow hoodie and blue jeans. 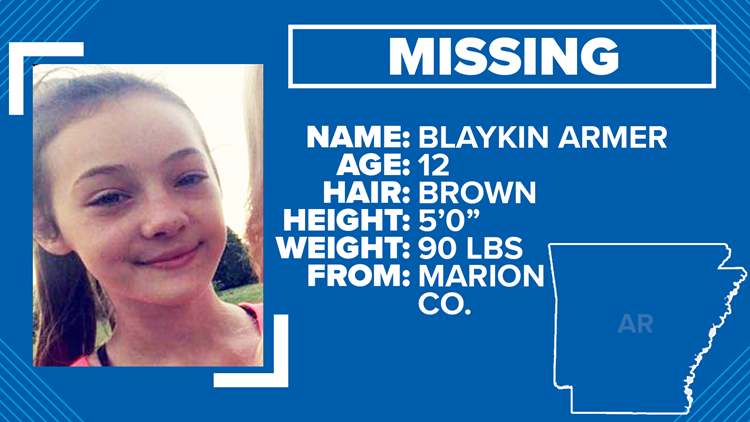 If you see Blaykin or have any information, please call the Marion County Sheriff's Office at (870) 449-4236.